The regional TV show “Vicinities” as a joint media project of the European Fund for the Balkans and the Center for Democracy and Reconciliation in Southeast Europe (CDRSEE) has received the special award in the frames of the European Citizenship Awards 2016. After the jury deliberation last week and the online votes, the judging members have decided to reward Vicinities programme with a special mention, celebrating its commitment and involvement in promoting an active citizenship and a vision of Europe based on solidarity and inclusiveness. 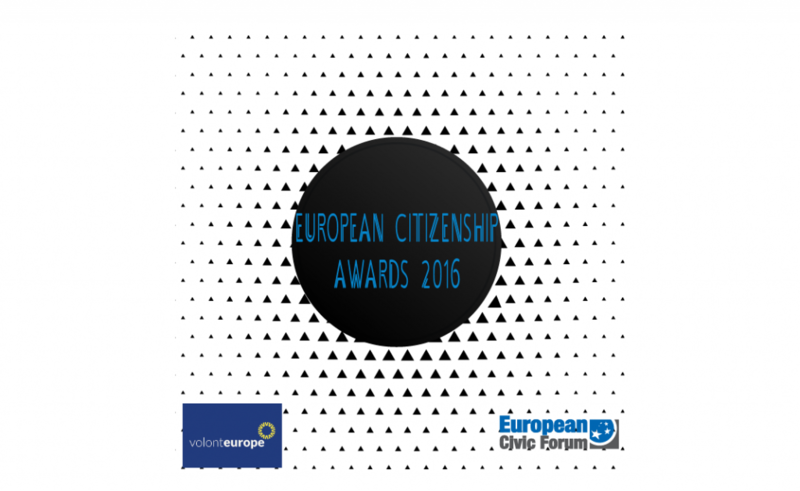 The European Citizenship Awards as a 2016 partnership between the European Civic Forum and Volonteurope, promotes and gives visibility to outstanding and inspiring initiatives and individuals who have put European democratic citizenship into practice, and in so doing have had a positive impact on their communities. The Awards celebrate the democratic and civic engagement of individuals, organisations, citizens’ groups, media platforms and social enterprises, recognising innovative initiatives and contributions which give real substance to European values, create ownership of public space and improve the lives of our communities in terms of democracy, social justice and universal access to rights. United Youth Journalists (International) – Best Media Initiative of the Year (It is an international youth lead project with the vision of raising awareness of what is going on in the world in order to collaborate in building the foundations of peace and sustainability. Through reliable, impartial news sources our aim is to share and learn, writing about the issues taking place in our region of the world. Bjorn Formosa (Malta) – (Volunteer of the Year) Bjorn Formosa is a 29-year-old from Malta who was diagnosed with terminal ALS last August 2015 and from then onwards he has worked tirelessly to find a cure for ALS and improve sufferers’ quality of life through the ALS Malta Foundation. Bjorn is focused on the Maltese ALS and motor neuron disease and sufferers. Agricoltura Capodarco (Italy) – (Social Enterprise of the Year) Agricoltura Capodarco Società Cooperativa Sociale, an organic multifunctional farm on the outskirts of Rome, founded in 1978 as an offshoot of the Community Capodarco of Rome. In 1978 the community was created in Grottaferrata and started agricultural activity with a group of disable and disadvantaged people, making it a model of social farming in Italy and the EU nowadays. Refugee Aid Miksalište (Serbia) – (Campaign of the Year) Given the large number of refugees coming to and through Belgrade since August 2015, on the “Balkan route”, as non-governmental organisations and humanitarian initiatives, NGO Mikser and Vlade Divac Foundation started a campaign to help refugees, by establishing a welcome point, transforming an open air venue, “Miksalište,” into Refugee Aid Serbia’s main support centre. The joint initiative came at a time when the European project is facing many challenges. Through the European Citizenship Awards 2016, the two networks recognised and gave visibility to outstanding initiatives and civil society actors who put European democratic citizenship into practice and have a real, positive impact on the lives of their communities – be it at the local, regional, national or European level.